My partner (Yu Ji) and I decided to expand on my earlier project and create a device similar to a flute which could be used to draw colors on a screen. 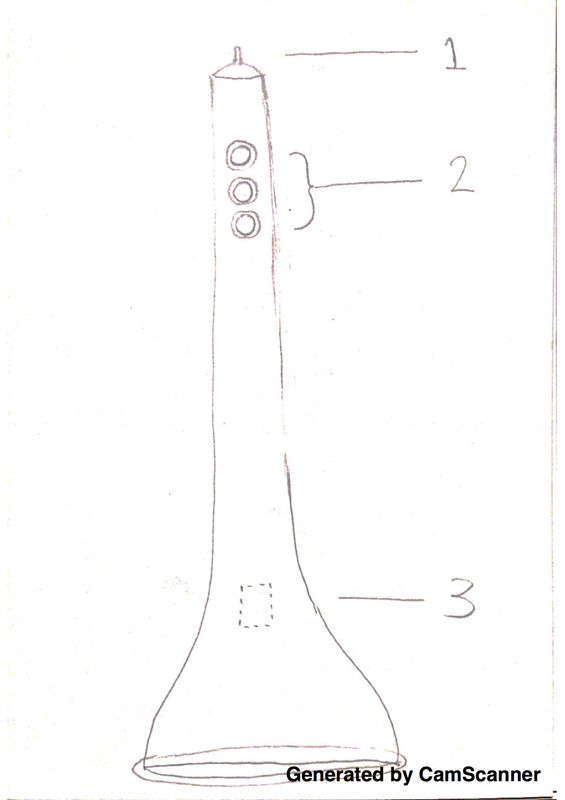 From the start Yu had wanted to use a sensor to detect blowing air, and a woodwind instrument seemed to be a good metaphor from which to start the design process. 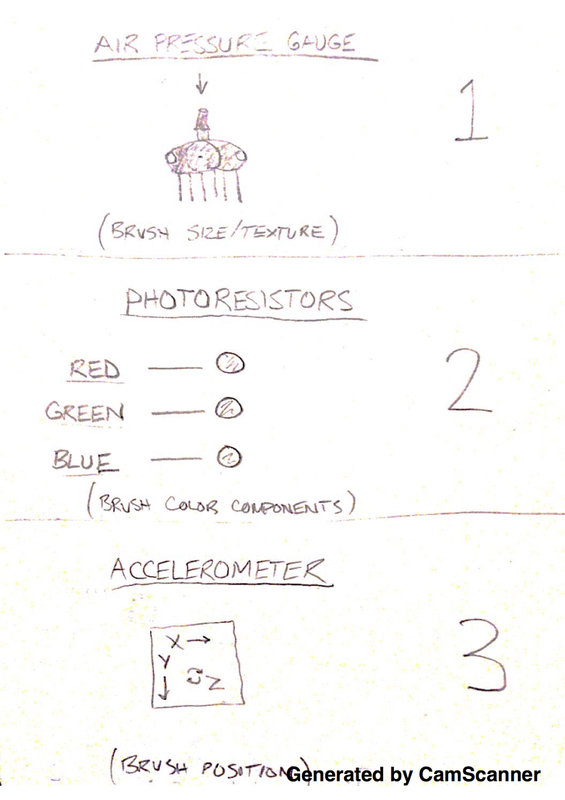 I drew a rough diagram of what we thought the device should look like, along with a few details on what sensors we wanted to use. We were going to use a MPX5100GP air pressure sensor but it proved to require a pressure far too powerful for a device meant for human breath input. Instead we used a simple piezo buzzer. 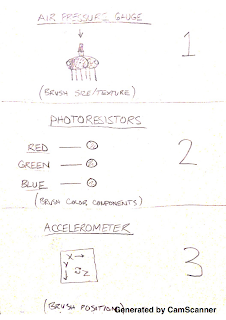 The rest of a diagram is accurate - three photoresistors, one for each RGB color channel, and an accelerometer to detect the device's movements. While looking for materials to house the device, we happened upon a long bamboo pole. Wanting to be economical, we decided to use it since it was free, but we also realized that it was aesthetically pleasing to combine a natural wood with bare sensors. I cut a small length from the larger bamboo and drilled small holes for the photoresistors. For testing purposes, we wired the necessary sensors to an Arduino Uno using a breadboard. It was at this stage that we decided to binarize the photoresistor values since it was difficult to achieve accurate results in dynamic lighting environments. Choosing a threshold value between "on"and "off" allowed us to use the photoresistors much like the holes on a woodwind instrument. Once we got everything running fairly smoothly, we miniaturized the circuit on two tiny breadboards hooked up to an Arduino Micro. I set aside channels for power and ground, and tried to minimize the area of the circuit by grouping like components together while allowing for sufficient space for the necessary wire connections. One of the hardest parts was inserting the miniature circuit into the bottom of the device. We used wires which were too hard to bend, and as a result at least one wire would come unhooked each time we installed the circuit, forcing us to repeat the process a number of times until the serial monitor confirmed that all of our sensors were functioning as desired. The finishing touches were acrylic glass end caps that I cut to hold the piezo in place at the top of the tube and the circuit in place at the bottom of the tube. I happened to have acrylic scraps that exactly matched the color of the photoresistors, which was a bonus. Above is the final result. This project was a challenge and it really helped my understanding of the device design process, from rough sketches to prototyping to fabrication to circuit optimization. It also highlighted our respective strengths. I was able to contribute much of the code and some of the elements of fabrication, and the "optimized" circuit I designed would have been a disaster without Yu installing the sensors into the physical device, making sure to keep the bundles of wires separated and marked, allowing for ease of troubleshooting later.